LTL shipping requires plenty of diligence and double checking on behalf of the shipper. All may seem in order: you've used proper packaging, paperwork is up to date, shipping addresses reviewed, accessorial requirements checked, and you are confident you are using the proper freight class. Then it happens. Your shipment is delivered safe and sound, but when the invoice arrives, your bill is nearly $100 over what you had anticipated. On further review, you learn you've been hit with a reweigh fee by the carrier. How did this happen? Freight reweighs are becoming more and more frequent, especially as dimensional and density based pricing becomes more common. It's important to understand what constitutes a reweigh, and what puts your shipment at risk. Many shippers, particularly small businesses, do not have certified scales that are large enough to accurately measure a larger LTL (less-than-truckload) shipment. This means that many of the weights listed on the BOL (Bill of Lading) are approximations, and carriers are pretty vigilant at checking for inaccuracies with their own certified equipment. A freight reweigh occurs when a carrier inspects and weighs the shipment and when the actual weight and the weight listed on the BOL do not match. One of the primary factors used to determine freight cost is weight, and in many cases, affects freight class as well. Often, a carrier will charge not only for the difference in weight, but also a fee for the freight reweigh itself. To avoid a freight reweigh, it is so important that shippers try to avoid "guessing" their shipment weight. If your business does have a certified commercial scale, you are a step ahead of many other shippers. Be sure to have it calibrated and checked frequently to avoid miscalculations. If you do not have a scale, it is key to obtain accurate measurements and weights for ALL of the materials being shipped. This can be even more challenging if you are shipping an assembled, finished product made up of several separate pieces and different classifications. Add up materials used on product spec sheets, catalogue listings, and product invoices to get as accurate a weight as possible. It can be beneficial to look at any inbound shipping invoices for any pieces of your finished product that were shipped to you as a supply order. In short, don't be tempted to take shortcuts. It pays to take the time to measure individually and make educated and precise estimates. Another mistake that many shippers make that encourage freight reweighs is neglecting to include packaging/packing materials in their calculation of gross weight. An average 48x40 pallet weighs around 30-40 lbs, and if you are shipping a multi-pallet load, that extra weight adds up fast. 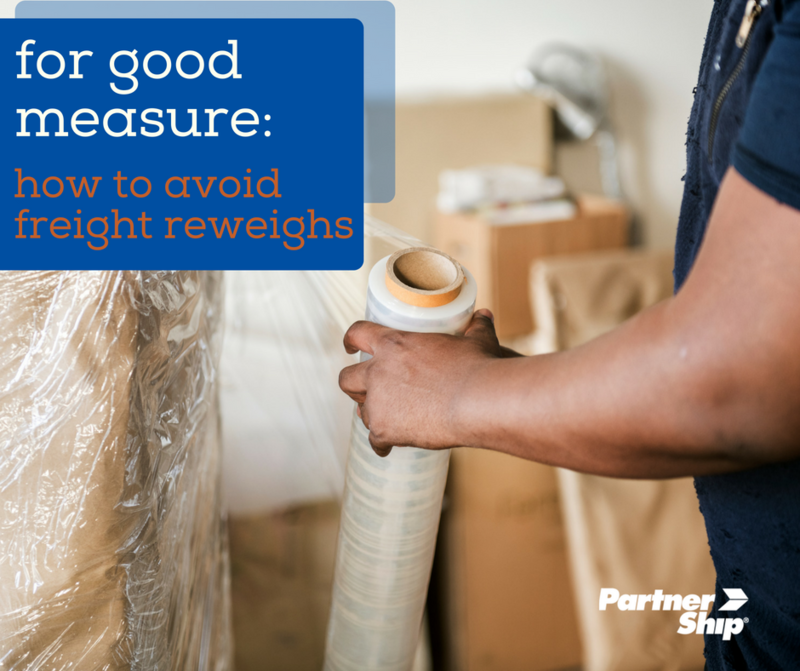 While it's always best to avoid guessing your shipment's weight, in the case shippers aren't able to weigh their shipments on a calibrated scale, it is important to factor this figure in the total. Additional materials used to protect your shipment such as molded plastic corner reinforcements, fiberboard, wooden stabilizers, and even foam inserts can increase weight, especially if you have a larger LTL shipment. It's key to remember that accurate weight is not the only factor that affects your shipment- it helps to determine your freight class, as well. For heavier, denser items that fall into the lower NMFC classifications, total weight of the shipment is used to calculate at price-per-pound. For less dense shipments that take up more volume, your freight class can be higher and your shipping more expensive. If you happen to overestimate the weight of your shipment, and it falls into one of these higher freight classes, you will be charged more at the higher freight class. It is crucial for shippers to know their precise weight, freight class, and your freight density in order to estimate accurate shipping charges. Even if you feel you've got everything in order, freight shipping can always lead to some surprises. While it's never a good idea to cut corners or knowingly try to mislead a carrier in the hopes of saving a couple bucks, sometimes even thorough shippers can get hit with some unforeseen charges. Don't let freight reweighs be one of them. The freight experts at PartnerShip have your back and can help make sure you are shipping smarter. If you have questions about determining your freight class or how working with a 3PL can help lower your shipping costs, call 800-599-2902 or email sales@PartnerShip.com to learn more.